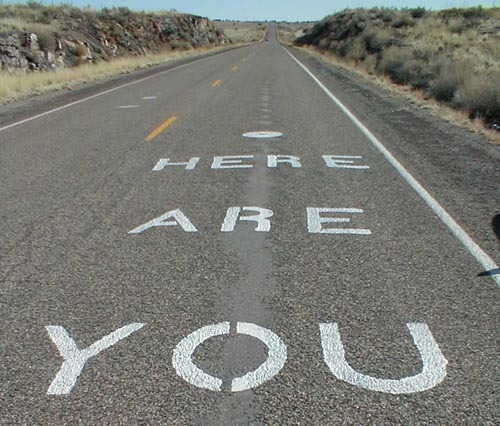 What Does it Mean to “Arrive”? A week ago Sunday a friend and I got together to practice being present. We sat at a shaded table outside a tea house and spent a moment taking a breath together. Then, we began to notice what was around us. That morning the wind was whimsical, its temperature and direction varying moment by moment, as if it were dancing and twirling around our bare legs. My friend, an experienced meditator and keen observer, pointed out that the breeze was coming from the south west. That’s a detail I hadn’t noticed, since I was focused on how the moving air felt against my skin. It reminded me of both silk and the cool colors of the spectrum, like purple, green and blue ribbons gently brushing against me. We watched as the wind caused some plants sway back and forth, like antennae searching for a signal. Eventually, we turned our attention to the sounds around us. These included other people’s conversations, muzak piped from a nearby store, cars and cyclists maneuvering in the parking lot. Acknowledging them was a way of befriending the environment, of drawing a circle of acceptance around it, rather than resisting the ambiance even subtly. It took many minutes, but after slowing down and sharing our impressions of what was happening around us, we both agreed that we had arrived to the now. Because we had allowed ourselves to settle, we connected authentically. Both of us left the encounter feeling seen, nourished and restored. Had someone been watching us, they would not have noticed anything special to indicate that we had, very deliberately yet delicately, landed in the present, akin to tapping into an invisible, endless and powerful reserve of well being. There was no diploma or certificate, no debutante ball, ceremony, signed contract, or other symbol to mark our “arrival”. Our results- and externally oriented culture suggests that some moments are more worthy of recognition or praise than others. Focusing on future goals, while important, also makes it tempting to either rush through, avoid, or dismiss experiences that don’t appear to contribute to that imagined future point of “arrival”. In our modern world, we are accustomed to things happening quickly, if not faster and faster, even if these things, and the speed itself, leave us spiritually malnourished, continually grasping for more. When I heard of the recent accident in Spain, in which a train traveling at more than twice the speed limit leapt the rails, my heart sank further as I learned that it took place near Santiago de Compostela. For many, this city marks the end of El Camino de Santiago, The Way of St. James, which I walked last autumn. As if to compound the tragedy, it happened July 24, the eve of the festival honoring the apostle. In addition to all the passengers who died, suffered injuries, and otherwise did not “arrive” as scheduled, I imagine there were hundreds if not thousands of the faithful and the simply curious who planned, or hoped, to complete their pilgrimage that day, striding, stumbling or limping into a jubilant and festive destination. That arrival, after weeks on foot at a pace of 2-3 miles/hour, can be emotional and powerful, even for non-believers, even on a normal day. I wondered what it must have been like for those pilgrims to walk into an emptied city, silent in its mourning. Perhaps some felt pure gratitude and relief for being alive and ambulatory. For others, maybe sadness and grief dominated, or numbness. It’s impossible to know. And it matters less what they felt, than that they felt something at all and took a moment to be with their internal experience in the moment it was happening. That’s arrival in the best sense, whether the context is approaching a stunning cathedral, attending a graduation, or simply setting foot in the grocery store. Otherwise, time can pass in a blur, and we can easily lose track of where, and who, we are. « Commitment: Choice or Coercion?